Set your cocktail hour apart with a choice of popular cold canapes catering – including both boutique and cold, sweet and savoury options. You could also plump for a selection of gourmet boutique canapes, with some of our showcase menu items including quails" eggs filo tartlets with smoked salmon, crème fraiche and dill, and fillet of duchy estate lamb marinated in rosemary and honey and served on a potato and leek cake with mint sauce. Need a vegetarian option? No problem! Our cucumber cups with roasted vegetable salsa butternut squash are just one of the many veggie alternatives. We also offer a range of expertly prepared bowl food – tiny servings and salads served in mini bowls or ramekins and eaten with a fork or spoon. Drawing on culinary influences from all over the world, these chic little dishes include halloumi skewers with Greek salad, a Spanish salad of squid, chorizo and chick peas, and a Chinese-style chicken stir fry with baby bok choy, oyster mushrooms and soy. As well as providing the professional waiting staff and necessary kitchen equipment for your even, the All in Hand wedding caterers package covers cocktails, champagne and wines, along with soft drinks, fruit juices and mineral water. Over the years, executive head chef Michael Glennon has perfected the art of balancing discerning tastes for bespoke dinner menus to please all clients – as our stellar testimonials go to show. Following an appetising canape reception, our wedding catering menus continues to set the standard among London wedding caterers. First course options include (among others) seared Diver-caught scallops with a crème fraiche, sweet chilli and watercress salad, butternut squash, parmesan and sage risotto, Nordic gravadlax with a crab tian and bread rolls. For your main, choose from a range of vegetarian, meat, poultry and seafood dishes, including,sea bass with saffron rice and asparagus spears or mushroom and tarragon strudels with madeira sauce. To leave your guests with nothing but fond memories, finish it all off with a dessert such as strawberry tiramisu, white chocolate profiteroles with raspberry puree or baked peaches with masala and crushed amoretti biscuits. Make the most of our free wedding planning services and schedule in a chic wedding afternoon tea, priced per person to include sweet and savoury buffet menus, cakes, scones, profiteroles, finger sandwiches and a selection of teas, along with champagne, sparkling wines and soft drinks. Whatever your requirements, get in touch with Michael Glennon for more information, to place an order, or to meet for a personal consultation. 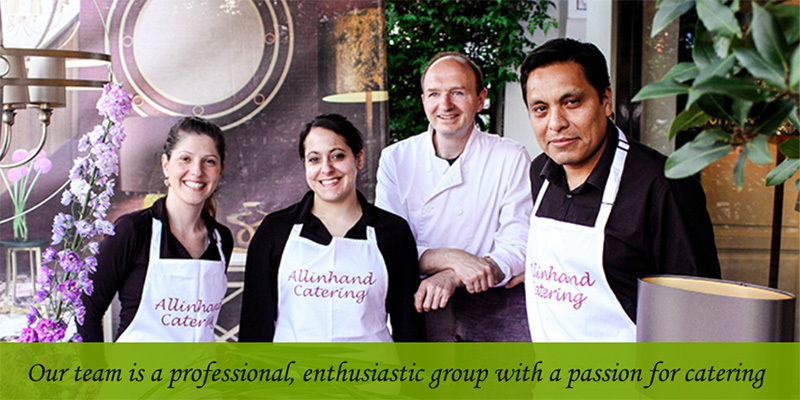 Catering for wedding parties and events both large and small, we at All in Hand work hard to make things effortless. As London caterers, we"re also no strangers to offbeat venues, tight deadlines and express ordering – requiring (unlike many other London catering companies) just 72 hours" notice for most weddings and sometimes as little as 48. 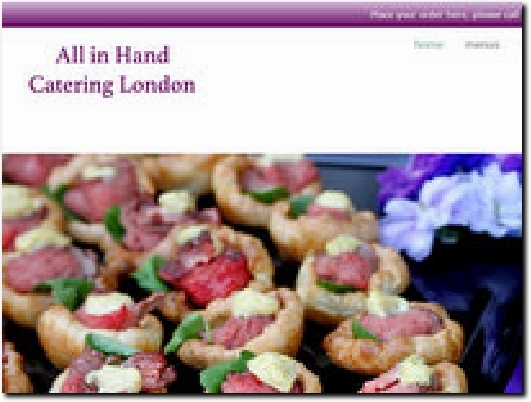 A creative London-based company specialising in canapes, finger buffets and hot and cold fork buffets. 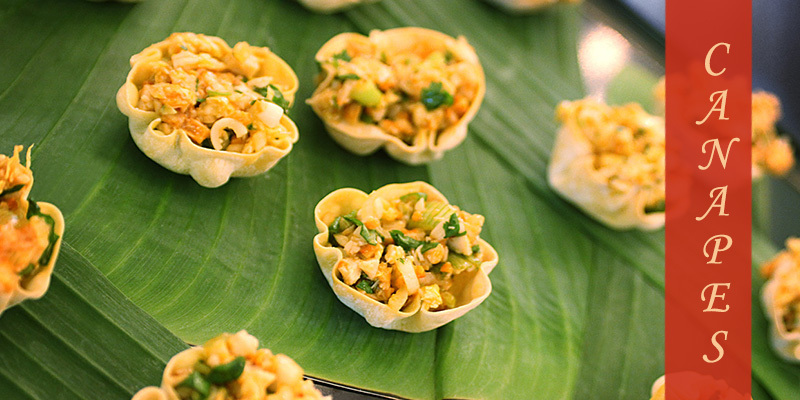 The Home page covers a range of canape options, including wedding catering. The Menus dropdown leads to numerous options while Services covers both private and corporate events. Testimonials can be found in the Clients section, while Contact has full contact details including an enquiry form.